General Flying 7 days a week, dawn to dusk. Competitions – Wednesday evenings (daylight & weather permitting). Training – advised via email to all members during British Summer Time (daylight & weather permitting). The Model flying basic training is available with Club instructors. Whissendine has a grass take off and landing area. Parking – Please leave space in front of the gate for unloading and turning. Park your vehicle on the gate side only with all wheels on the grass. No Parking is permitted on the other side which then allows for large tractors to pass. Entry – Entry to the field is by a hand gate with a combination padlock. The last person leaving the field must ensure the gate is locked. Always keep the gate shut to prevent any of the farmer’s animals from escaping. Your Membership Card (Key Fob) is your authority to fly at this site. All pilots must adhere to the designated flying zones as shown on the site plan in the members handbook. Always fly in front of you at all times. When Flying, ALL pilots must stand in the pilot’s box on the flight line. Start your engines in the pits area with your propeller facing outwards towards the field. 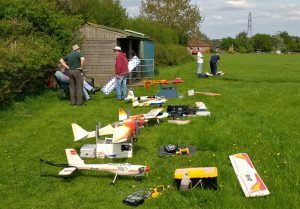 Where possible always carry your aircraft to and from the mown take off and landing area along the mown pathway. Failsafe – All power models – including electric powered (when fitted with a receiver with a failsafe function) must be set to a minimum of throttle to idle on the loss of the radio link, regardless of the model’s weight. Models over 7kg must have a working and set failsafe. A First Aid Box is located inside the mower shed. 9am – 10pm (or dusk) whichever is the sooner in any one day Monday to Sunday. 12 noon – 8pm (or dusk) whichever is the sooner in any one day Monday to Saturday. 10am – 4pm on Sundays or Bank Holidays.